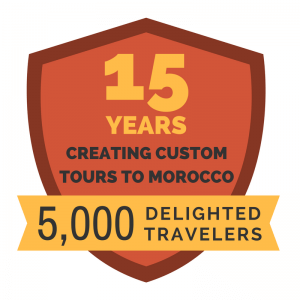 One of Morocco’s best features is that its diverse traveler attractions allow for a variety of unforgettable experiences in one trip! You are in the beautiful country for only a few days! Where do you go? 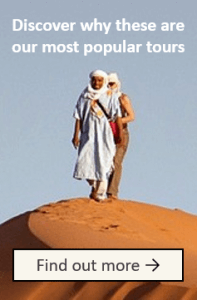 Here are our top 5 places that you absolutely cannot miss if you are visiting Morocco. The experience of huge sand dunes as far as the eye can see is enough to push this location to the top of this list. An added bonus is the opportunity to see the breathtaking open desert sky at a desert oasis. Exhale around the fire, and treasure your close up glimpse of the Milky Way. How do you get to this piece of paradise? On the back of a camel! To really get to see and taste a fantastic part of Moroccan culture, travel to a city that almost seems to stands still in time. The houses and their flat roofs are connected to create a network of streets lined with orate doors and shops. Visit the weavers pushing their large wooden looms back in forth in an endless rhythm and see the hand knotted Berber carpets that decorate the walls of the streets. Taste the handmade Moroccan olives and other savory treats. Hear the metal workers pounding out intricate designs on copper teapots and other craftsman proudly showing their trade! 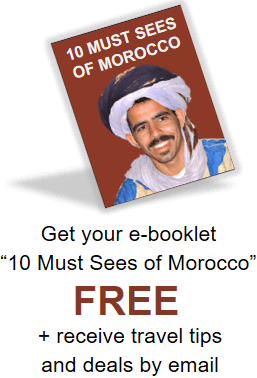 You will get a true Moroccan experience in the medina of Fes! If you are interested in history, you will be fascinated to hear your guide tell you about this 9th century city’s progression from medieval times to a city filled with satellite dishes. If you are an art lover, you will want to stop at every single mosaic fountain to admire the hand cut tiles. For those with religious interests, Fes also holds ancient mosques and deep religious history. 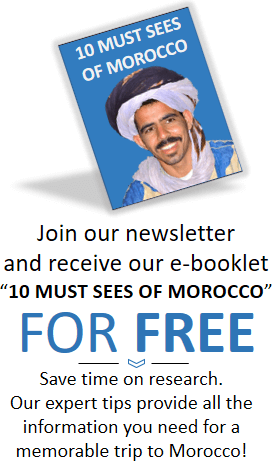 Visit the enchanting city of Chefchaouen, with beauty that can hardly be captured by a camera. What is so incredible about this city? A majority of this quaint city is painted bright blue and white, giving it the appearance of being underwater or belonging in a fantasy world. It is also located on the side of a mountain. During the summer season it is covered in red wild poppies! This city is quickly climbing travelers’ lists of favorite destinations. It is celebrated for its night life and its fascinating square. Tons of performers gather in the square showing of their acrobatic routines, snake charming music and other captivating performances. Ride a fancy horse-drawn carriage to this location and enjoy the show! Make sure that you also explore the medina and visit the beautiful gardens of Marrakech. For more ideas of what to do in Marrakech, check out our guide: 16 Things to Do for a Successful Visit to Marrakech. What vacation would be complete without a trip to the beach? This charming village sits on the edge of the ocean. Split your time between meandering through the shops as well as walking down the boardwalk at the ocean. This city is known for its wind and wonderful conditions for surfing. If you’d rather not surf, you can swim or eat a Moroccan pastry on the beach while enjoying the African sun. Get some ideas on what to do in Essaouira here. Whether you are looking to feel the sand of the Sahara, explore the Fes medina or enjoy the beach, Morocco has something for everyone! My advice? Try it all.